Why choose a professional landscape lighting company? Landscape lighting helps create a resort-like feel that brings the home and landscape together. A well-lit landscape will highlight textures that cannot be seen in normal daylight, creating an ambiance unlike any other. Architectural features of the home like bricks or stone can be highlighted to create stunning curbside appeal. Outdoor lighting enjoyably extends the time spent outdoors. With our Des Moines, Iowa climate, we think that’s extra important! Now outdoor kitchens, patios, pools, and children’s play areas become entertainment venues or just relaxing places to unwind. Turn off the flood lights and let the low-voltage lighting create a relaxing atmosphere for you and your guests to enjoy. Hazards such as steps, low-hanging or thorny vegetation, abrupt elevation changes or toys in a walkway can be avoided with properly placed landscape lighting. Even though property owners know their way around, guests may not. It is a proven fact that a well-lit landscape will deter potential intruders by eliminating dark areas and shadows that would conceal movement around the property. 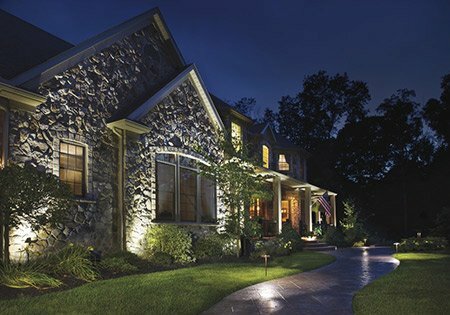 Outdoor lighting and landscape lighting also allows the homeowner and neighbors to see and identify potential intruders. A night time demonstration of the landscape lighting will allow you to be involved in the design process and permit you to accent your landscape just the way you want it. From a personally pleasing perspective, landscape lighting brings the property to life. From a practical perspective, professionally installed lighting provides an excellent return on investment, because it creates a marvelous first impression when viewed by family and friends or possible prospective buyers. So whether you are looking to light up your outdoor kitchen, patio, water feature, entry way, pool, or your entire property, give the professionals at Earthly Possibilities a call and schedule your night demonstration. Call us today. Browse all of our Landscaping Services!